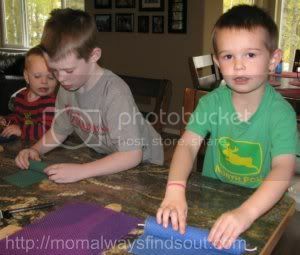 My children and I enjoy doing crafts together. I’m always looking for things to do that will be fun and easy for us to make. I had never even thought about making candles until we recently received a “Make Your Own” Beeswax Candle Kit from Toadily Handmade. Rolling the beeswax candles with the honeycomb sheets was so easy, plus the kids loved watching our candles burn when they were done. I just LOVE useful crafts! Made from 100% natural ingredients, beeswax candles are a very eco-friendly choice to have around the house. In fact, the negative ions produced when you burn beeswax candles actually work to purify the air from things like odors and allergens. We noticed that the candles we made burned very cleanly compared to traditional candles. It seemed like every bit of wax burned, not a drop was wasted! There are so many shapes and colors of candles you can make with the Beeswax Candle Kit. We started out keeping it simple and rolling tall, thin pillar candles and some shorter, fatter ones. I used one of our metal cookie cutters and made a ghost-shaped candle to use as a Halloween decoration. Other candle possibilities include sushi candles, tapers, advent candles, and golf ball candles. 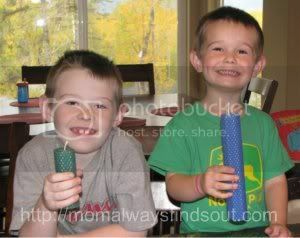 Beeswax candle-making is a great family time activity. Even young children can get in on the fun and it’s virtually impossible to make a mistake. My kids have asked to do it over and over again. The Make Your Own Beeswax Candle Kit is a wonderful gift idea for children and families. Each kit comes with an assortment of colored beeswax honeycomb sheets, natural cotton wick, and instructions. Visit Toadily Handmade’s website to see more of their pure and natural products, including Handmade Beeswax Advent Candles, Taper & Pillar Candles, Tea-Light Candles, Sushi Candles, Unity & Wedding Candles, Honeycomb Beeswax Candle Sheets and DIY ‘Do It Yourself’ – Make Your Own Candle Kits. Disclaimer: I received a Make Your Own Beeswax Candle Kit for review purposes. All opinions expressed are 100% my own, based on personal experiences with the product. Very cool craft for kids. A few years back I ran the kids group at the local church. I had this 5-7 years old. This would have gone over big with them! They sure made some pretty candles!